I contributed to the Channel 4 programme "The 100 Worst Pop Songs", in which I vainly attempted to defend "diamond Lights" and others! I was a contributor on BBC-2's "FAMES SET & MATCH" ON Sat. 16th Nov 2002, discussing my involvement with GLENN HODDLE and "Diamond Lights". 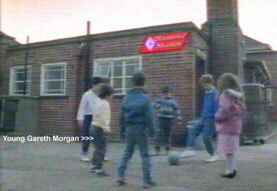 I was one of the "experts" seen on Channel 4's TOP TEN FOOTBALL SONGS, on Mon. 3rd June 2002, discussing the merits and otherwise of some of the projects I have been involved in since 1981. The programme was repeated on Sun. 18th April 2004. 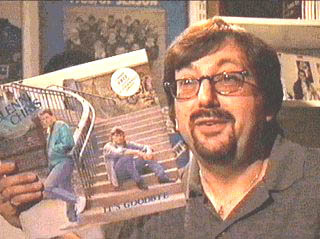 Illustrating that I still had a "garage-full" of copies of Glenn & Chris' "It's Goodbye"! 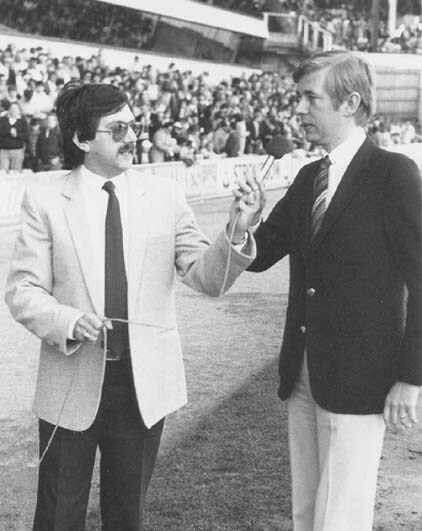 I first encountered Brian as a listener to BBC Radio Sport, and discovered he loved cricket when, as a fourteen year old, I got his autograph at Lord's, during an England v. West Indies Test match, in 1966. 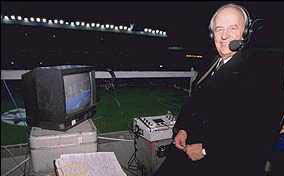 Of course, he provided the radio commentary for that year's World Cup Final, but I never heard it - I was at the match at Wembley! In 1978, whilst I was working for Jet Records we received a call from Brian's secretary asking if he could purchase 2 tickets for one of E.L.O. 's concerts, for his son Simon. Apparently Simon had applied too late to the Box Office, and his cheque was returned. As I was responsible for distribution of 'comps' to radio and TV contacts, I found two spare and delivered them personally to his office at London Weekend TV. And that's how or friendship started. Brian was such a gent. He insisted on buying me lunch, which became quite a regular occurrence. 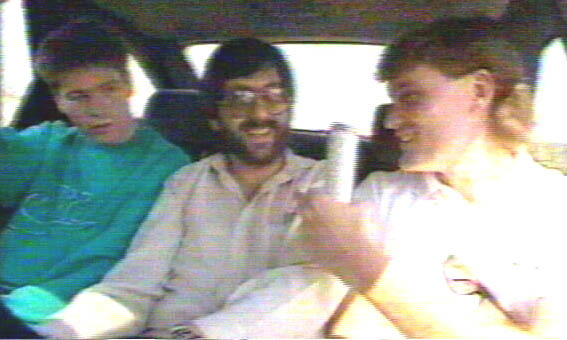 In fact, on one memorable occasion, I was driving back to my office from LWT (where I'd consumed a little more wine than I'd ought, seeing as I behind the wheel). Anyway, I was stuck at the traffic lights in Parliament Square, when I saw a flash of fire and I heard a large explosion. Fearful that the place would be swarming with police, I got away as soon as I was able. By the time I'd returned to my office, I'd heard that the Tory MP Airey Neave had been blown up, and I was almost a witness ! Shortly after those E.L.O. concerts at Wembley and the World Cup in Argentina which we all watched on TV, I moved into my new house. Spurs had just signed Ardiles and Villa (plus John Lacy!) and you couldn't get a ticket for the first match of the season - away at Nottingham Forest. Brian Clough had been on Brian's ITV World Cup Panel, and so I phoned Brian to see if he could blag a pair of tickets from Cloughie. He called back ten minutes later to say that they would be left for me to collect. My friend came round early, that Saturday morning. I wasn't ready, as I was painting my lounge ceiling. In fact, I'd gone up one rung too many on my step ladder, and had white paint in my hair. No time to clean up, I jumped in the car and we went up the M1 on a very hot day. My mates wanted to have a decent lunch at the Albany Hotel, but I couldn't join them - I looked too much of a mess, so I found a DIY shop and bought some more paint! When I collected the tickets at the City Ground, they were for seats in the Director's Box! Well, despite my paint-spattered clothes and hair, we went in and hadn't got more than 15 yards, when I was challenged by Cloughie himself. I apologised for my appearance, and explained I was I friend of Brian's. He shook me by the hand and told me to enjoy the match. I did, especially when Ricky Villa scored! 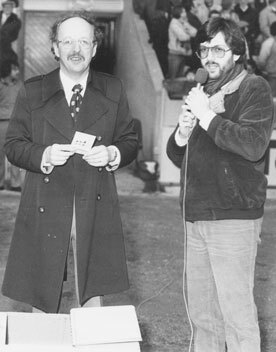 Over the years, after I began my stint as the DJ at Spurs, Brian always popped into my booth at White Hart Lane, whenever he was covering a match there. Nowadays, we take live TV coverage for granted, but in the Eighties it was different. Brian would fix it for me to watch Spurs away games live in his office, as they were beamed back to LWT, ready for editing for The Big Match highlights. He introduced me to Jimmy Hill, Bob Wilson and many others at the BBC, who would extend similar courtesies when the BBC were covering Spurs for Match of the Day. The same applied for those mid-week European away-legs, at Thames TV and again, the Beeb. Brian really was a lovely fellow, who adored his beloved Gillingham. I'm honoured to have known him, and I will miss him. I offer my deepest condolences to his family. Front Row (L to R): Melvyn Gale (cellist with E.L.O. ), Bev Bevan (drummer with E.L.O. ), Team Mascot Britt Ekland, and Trevor East (Producer & Presenter of Central TV's 'Tis-Was'). Back in the late 70s, when I was working for Jet Records, I helped put together an E.L.O. 5-a-side team, to participate in the annual "Goaldiggers" tournament. 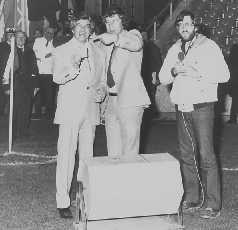 "Goaldiggers" was the brainchild of Elton John, Jimmy Hill, and Brian Moore, who got teams of pop stars, and show-biz celebrities to compete at Wembley Arena, to raise thousands for charity. Each team was allowed one soccer professional, and here is our squad from 1979, at our solitary training session. Even though Jeff Lynne's other commitments prevented him from playing in that year's tournament, he did play in the previous one. Jeff, of course, is well-known as a Birmingham City fan, and through him, I got to know Trevor Francis very well, even though Trevor was a Nottingham Forest player at this time. Trevor invited me to join him for a drink at the Hadley Wood hotel, where the England squad was staying, prior to the match against Bulgaria. Glenn Hoddle had been selected for the first time, and we pulled up alongside each other in the car park, in our Ford Capris. Mine a basic gold model, and Glenn's a black customised JPS special. That's how I first got to know him. In May 1980, a few months before I began to work at Spurs, I arranged for Glenn to make a pilot programme for BBC Radio One. In the event, it wasn't commissioned, but at least we had a photo taken! Having been a Spurs supporter since the beginning of the 60s and season-ticket holder for many years, by 1979, I had become a little underwhelmed with the quality of the pre-match entertainment at White Hart Lane. I used to travel to all away matches, and on one train journey, returning from Leeds, I struck up a conversation with a fellow traveller. He introduced himself as Harry Harris of the Tottenham Herald. We got talking about how Tottenham could do with a new Stadium Announcer. He wondered if I might be interested, should the position become available. I explained that I had been a Hospital Radio presenter for about five years, and that I might be - though I was undecided. He promised to drop my name, when the opportunity arose. Over the years, I had contacted the Club when I had wanted to bring a VIP guest, and had been afforded great hospitality. On one particular occasion, I had accompanied David Cassidy, after I had taken him to appear on Radio 1, and we were treated royally. 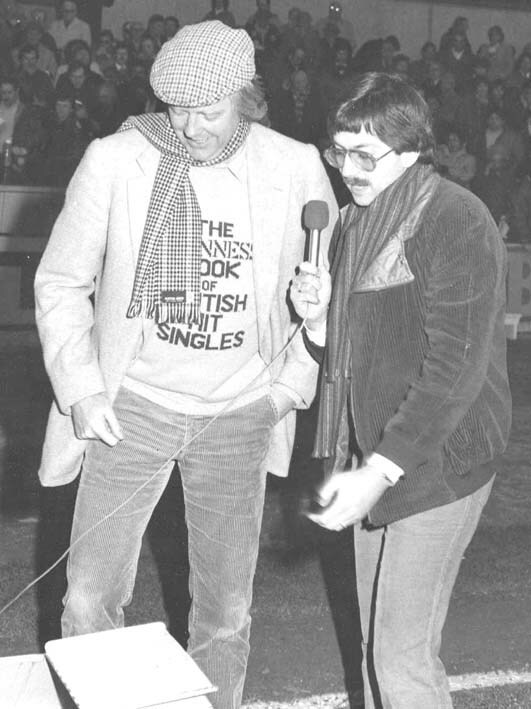 However, in early 1980, I wanted to take the Radio One DJ Andy Peebles to a match. 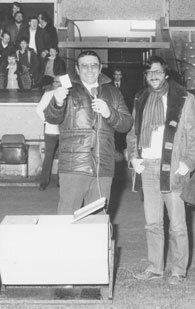 Andy had been the Announcer at Manchester City's Maine Road ground, when he worked for Piccadilly Radio, and suggested to me, as we watched the game, that I would really enjoy it if Tottenham Hotspur offered me a similar position. Some weeks later, during the close-season, I had lunch with Peter Day, the Assistant Secretary at Spurs, as a kind of "Thank You" for the excellent tickets he had supplied Andy Peebles and myself. During the meal, we talked about the DJ position at Spurs. He told me he was looking for somebody new, and asked if I would ask around the guys at Radio One and Capital Radio, seeing as I knew them all. Nobody was prepared to make themselves available for EVERY home match, so when I called Peter, I said that I'd be up for it. 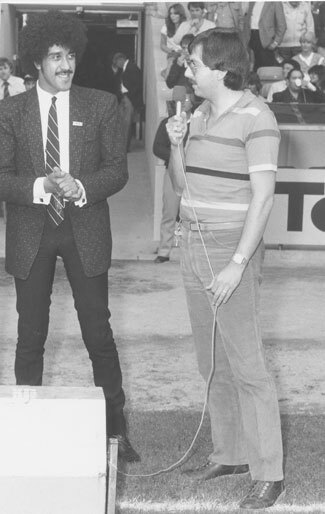 I made my debut on the opening day of the 1980-81 season (sharing my debut with Steve Archibald and Garth Crooks), playing the hits and announcing all the team changes, goals, substitutions, etc. at the game against Nottingham Forest. 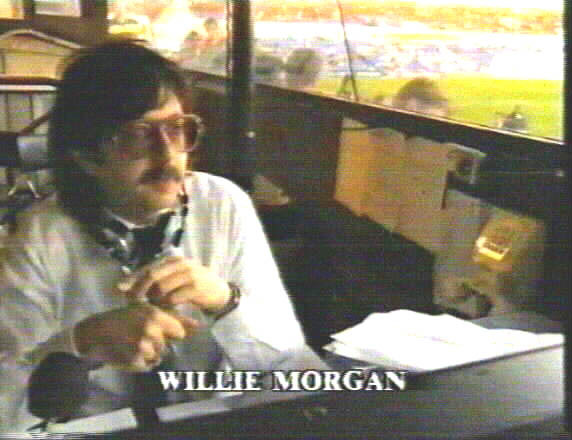 "Hello this is Willie Morgan, and welcome to White Hart Lane - the world-famous home of the Spurs". It was my plan to present a sort of two-hour radio show over the Spurs speakers, prior to each match. I introduced a couple of features, which became very popular: My Top 5 was literally that. Each match, one of the first team squad picked his five favourite records, and chatted to me about each one before I played it. These were pre-recorded, and were a lot of fun. The other feature was The Memory Jerker, which ran for many years. As a kid, I'd always associated memorable matches with songs I'd heard on the radio, on the way home. 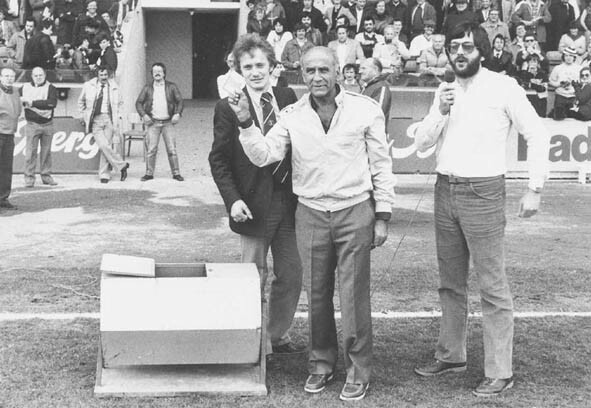 So the plan was to select a game from the corresponding week, but some years before, and to read out a short résumé of the match details at 2.45pm, and then round it off by playing the song that was No.1 on that day. For some years, I wrote some details about each edition in the match programme, and included a photo of the singer or group. Simple enough, but believe me, it took an awful lot of research. "THE OFFICIAL HISTORY OF TOTTENHAM HOTSPUR FOOTBALL CLUB"
As the history books show, my first season was one that ended at Wembley, with an FA Cup Final Replay victory against Manchester City, and that wonder-goal from Ricky Villa. But that was not before the players had gathered at the Portland Studios in London's West End, on 21st April, to join Chas & Dave in the recording of "Ossie's Dream (Spurs Are On Their Way To Wembley)". 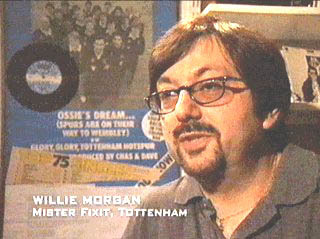 Ossie Ardiles had gained a reputation for being unable to pronounce "Tottenham", only managing to say "Tottingham", and Chas & Dave had incorporated this into the lyric. However, at the recording, Ossie was very proud that he could now say the word properly. We had to convince him to sing the line "...in the Cup for Tottingham"! Just as the session was ending, I asked "What about a B-side?" Chas asked if I had any ideas, and I said that I had written new lyrics to "John Brown's Body" and I'd called it "Glory Glory Tottenham Hotspur". Obviously the lads knew the tune, and I took 30 copies of my lyrics from my briefcase and handed them out. It was down in two takes, and became the legendary song that was played as the Spurs took the field at White Hart Lane for almost the next 20 years! A couple of weeks later, the song was riding high in the Charts and, as the publicist for the record, it was my job to ensure it was played on the radio. The producer of BBC's Top of the Pops asked me to have the players available for the programme, the week of the Cup Final. The snag was that, unusually at that time, it was to be a LIVE edition on the Thursday, and not a pre-record. Manager Keith Burkinshaw told me that he would release the squad for the programme, but that they had to be back at their hotel by 6.30pm, which meant appearing on the programme, live, would be impossible. I was able to persuade the show's producer to tape their final 'dress rehearsal' at 4.15pm, and slot it into the live show. Nobody would know, except the kids in the audience! He finally agreed, but it created a small problem. He had planned to have lots of boys and girls from the audience surrounding the players, waving Spurs flags and scarves, etc. As the audience isn't admitted until the actual show, I had to rustle up some people we knew - at short notice - and it was quite a dodgy crew. To my embarrassment, I was among them, in the middle at the back, with my arms aloft holding a scarf. There were a couple of false starts, for technical reasons, and on the take that was used, I can be observed completely out of time with the rest of the fans. As they swayed to the left, I was swaying to the right, and vice versa! Paul Miller later told me that they watched that video in the team bus, on the way to the Cup Final (and Replay) and the lads just fell about laughing at my efforts! What the heck, it got to No.5 in the Charts, Spurs won the Cup, and I made a few quid as the arranger of the B-side which, when you think about it, sold the same 192,000 copies as the A-side!!! A year later, we did it all over again. We recorded "Tottenham Tottenham" at the Regal Sound studio in Hitchin, on Mon. 5th April (two days after defeating Leicester City in the Semi-Final), though this time Chas & Dave nor their manager would entertain one of my compositions for the B-side! They did, however, agree to my suggestion of recording a medley of "Grand Old Team" and other popular Spurs chants. Once again, Top of the Pops was to be another LIVE transmission, but thankfully the producer Michael Hurll (a QPR supporter) booked the squad for the show of 6th May, over two weeks before the Final. Amusingly, both England and Scotland had 'World Cup' records in the Charts that same time, and so we had the TOTP studio awash with professional footballers! Steve Archibald may have made a bit of history by being part of the Scotland squad singing "We Have A Dream" behind B.A Robertson and John Gordon Sinclair, before joining his Spurs colleagues on "Tottenham Tottenham", all on the same programme. However, minutes later Ray Clemence and Glenn Hoddle had to dash across the studio to join their England colleagues on (the Spurs fans' Archibald-anthem) "We'll Take More Care of You (Fly the Flag)", amongst a bevy of beautiful British Airways air hostesses. It became a bit of a party night, so much so that all of the footballers adjourned to the bar even before the programme had ended. They all missed meeting Paul & Linda McCartney, who made a surprise walk-on appearance at the end of the show, after the video of that week's No.1, "Ebony & Ivory" had been shown. I'm told that one footballer (whom I won't name) was spotted with a member of Pan's People, in a compromising position!!! Now THAT'S the way to prepare for an FA Cup Final! 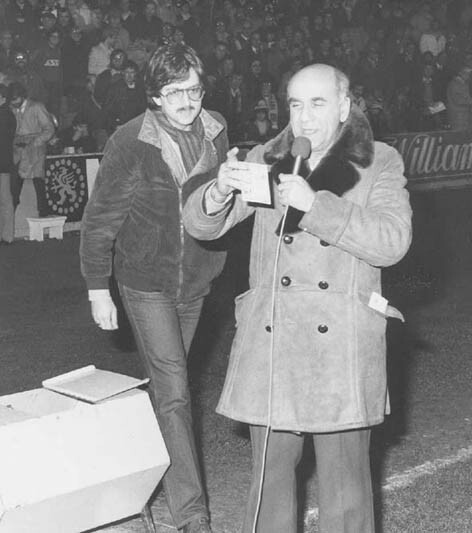 For a number of years throughout the 80s, we had a half-time draw for the lucky £1000 Spurs Lottery Ticket. I would go out onto the pitch, microphone in hand, and we would invite a celebrity guest to pick a ticket from the drum. There were one or two mishaps, notably when Eartha Kitt decided to spin the drum rather too vigorously... the hatch fell open and hundreds of tickets fell out onto the pitch and were promptly blown away on that windy afternoon. She then took the microphone from me and addressed the White Hart Lane faithful in Spanish! Talk about, on another planet! In early 1983, when he was riding high in the Charts with "Up Where We Belong", Joe Cocker came to Spurs, and by coincidence, also there that afternoon was Paul Young. They joined me on the pitch at half time, and somebody went home a grand richer - not me! Earlier that season, when Manchester City were the visitors to White Hart Lane, one man who was not going to miss the match was their long-suffering supporter, comedian Eddie Large (of Little & Large). I'd also heard from my old friend Steve Payne of Polydor Records, that he was bringing Billy Fury to see the game. I had been a fan of Billy's since I was a kid, and he had just released a new version of Bobby Vee's "Devil or Angel". It was great to see Billy looking so well, as I'd heard that he'd not been too well, lately. Well, as you can see Eddie gave us all a laugh, I enjoyed a drink with the both of them after the match. Sadly, Billy Fury died just a few weeks later. 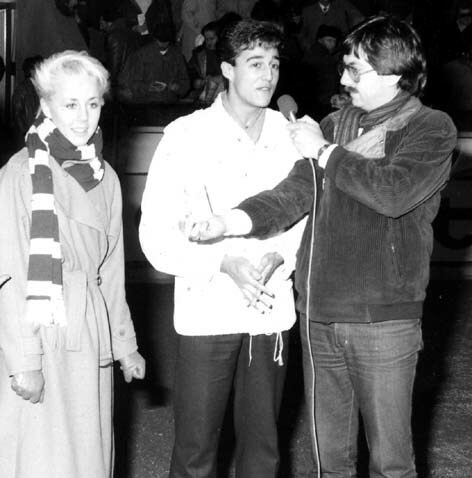 Also joining me on the pitch that season, was one half of Wham!, Andrew Ridgeley, who brought with him Shirley Holliman, then one half of Pepsie & Shirley. These days she's the other half of ex-Spandau Ballet / Eastenders star Martin Kemp, whilst Andrew keeps a bit of a low profile. Another old friend of mine, who came along to draw the winning ticket at Spurs, was Tim Rice - some years before he gained his knighthood! On the night, he used the opportunity to plug the latest edition of the book I often refer to as my 'bible': The Guinness Book of British Hit Singles. For many years he, together with his brother Jonathan and DJ Paul Gambaccini, compiled this mighty tome, that has, on many occasions, got me out of trouble in my radio studio. On this particularly cold night, we were glad to get the draw out of the way, and get a warm cuppa, before the second half. 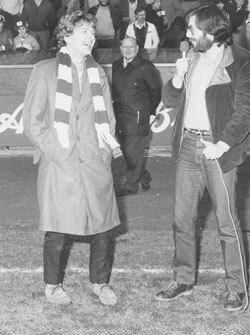 One regular face in the Sponsors' Lounge, during the 80s, was the Irish broadcaster Henry Kelly. 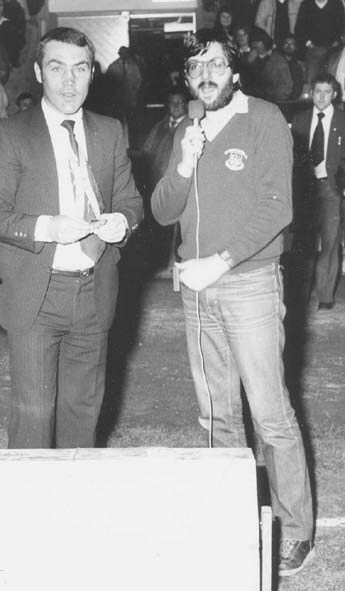 His 'after-dinner' speaking on those occasions would amuse our guests, and on occasion he would come down to join me on the pitch during the half-time interval, to draw the winning ticket. who unlike his alter ego Alf Garnett, is a genuine Spurs supporter ! With BBC weatherman Michael Fish, who didn't suspect a hurricane that day, either ! With Boxing's former Middleweight Champion, Alan Minter. 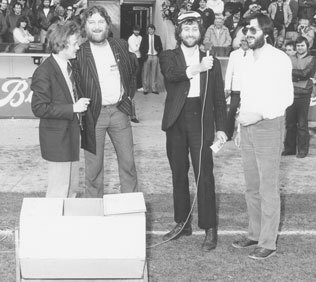 And, of course, Chas & Dave were regular visitors to the Lane, and Lottery Manager Graham Heap would often drag them down to the pitch for the Half-Time Draw. On a couple of occasions, they would actually play a live set, and entertain the fans prior to kick-off. They also provided a great atmosphere at our 1991 post-Cup Final Banquet, at the London Hilton, when I provided the disco. 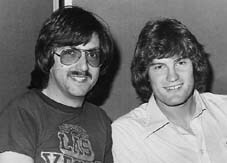 I suppose all the players I have known have been interested in music, but none ever fancied themselves as singers - except Glenn Hoddle! He'd given me a tape of him singing Elton John's "Saturday Night's Alright For Fighting", soon after we met, and I always had this idea of making a record with him. In fact, following the success of "Ossie's Dream", we got the players to record a Party album for Christmas '81, and Glenn solo-ed on "Hey Jude" and "Happy Christmas (War Is Over)". Indeed he also sang "We Are The Champions" on the 1982 England Squad's World Cup album. About five years later, he told me in the Players' Tunnel, before a midweek game, that he had a tape he'd like me to listen to. After the match, I met him outside the Dressing Room, and we went to his car, where he played me a tape of "Diamond Lights". I was amazed. He explained that, through a guy named Pat Nelson (a friend of Chris Waddle's), they had met a songwriter named Bob Puzey. Bob had previously had a few hits with the Nolans ("I'm In The Mood For Dancing", "Attention To Me", etc. ), and had written this song "Diamond Lights", and I felt it really worked with Glenn singing the lead, and Chris the low counterpoint. I asked Glenn if they had a 'deal' for it, and when he said that they didn't know what to do next, I said they should leave it to me. I contacted a number of major record companies, but there was a lot of cynicism surrounding two England footballers making a non-novelty record. I began to focus on labels that were run by football fans. I spoke to Muff Winwood at CBS/Sony, who was an old friend of mine. I'd known him since he and his brother Steve were in the Spencer Davis Group, and I knew that he was on the Board of Watford FC. Muff copped out by saying that they were looking to sign only long-term "album acts", and had misgivings as to whether it would actually make it as a hit single. He asked me "Do you think Radio1 will play it?" and I told him that I had plan to ensure it, but he wasn't convinced, and he passed. 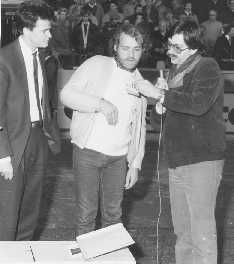 Some years later, when he was a guest on my radio show on Chiltern SuperGold, he admitted that he might have got that one wrong! Anyway, I went along to see Jeff Weston and Howard Caplan at Record Shack Records, in Soho. They were based at the back of their funky record store, and although they had scored quite a few hits with Soul and Dance material, I knew they were keen to score in the mainstream. I also knew they were both Spurs Season Ticket holders. They loved the song and they saw the great potential, and they were prepared to pull out all the stops in a marketing campaign. I set up the deal, and after a particularly fine lunch on Thu. 26th Feb, we posed for photos (right) and were off and running. Record Shack spared no expense. We were all back in the Red Bus studio on the evening of 9th March, to overdub extra vocals and to remix the track, and the next afternoon we rendezvoused at the West Hampstead studio of top photographer, Brian Aris to shoot the cover photo. Glenn & Chris had brand new stylish haircuts, and the 'mullets' were finally gone! Of course, as all this was going on, Spurs were again making steady progress in the FA Cup, and both lads scored in the 2-0 Quarter Final win at Wimbledon, which certainly didn't harm the publicity for the record. We shot a video the next day, and as a special treat for my son's 5th birthday, Gareth was allowed to be one of the kids in the opening shot. Look out for him in his yellow top! The Press launch in the top floor cocktail bar of the St. George Hotel in Regent Street took place on 26th March. It was a huge success and resulted in positive articles in the national press, and Adrian Thrills wrote a great piece for New Musical Express. The radio support was great, not just on Radio 1 and London's Capital Radio, but also local stations all over the UK. Even Radio Clyde in Glasgow was playing it! I was really working hard, behind the scenes, fixing radio interviews and arranging TV coverage. I fixed up for the lads to appear live on BBC's Saturday Superstore on 4th April, as neither expected to be fit for that day's game at home to Norwich City. In the event, only Glenn could turn up for the TV show and even then, he had to report to White Hart Lane for treatment by noon. That was no problem as, I'd need to be there, too, in my capacity as DJ. Well, as Gareth came with me to every match, he also joined us at TV Centre. Security was especially tight that morning, and we found out why, when we arrived at the studio. Another of Mike Read's guests was Prince Edward, who was charming. He asked Glenn if he was planning to give up football to concentrate on his singing career, and Glenn pointed to me and said "He's trying to persuade me!!" NOT TRUE ! When it was time to go, Glenn got held up signing autographs for the crew and I was worried that we'd be late getting to Tottenham. Suddenly I didn't know where he was, and I told my 5-year old to see if he could find him. The next thing I knew, I heard Gareth's voice call out "Excuse me, Prince Edward, my daddy's trying to find Glenn. Do you know where he is?" to which he was told, "I think you'll find him through there, in make-up." I don't know where he got his 'front' from !!! We made it to Spurs on time, but not before we got bamboozled trying to get out of the BBC's car park. While all this was going on, Chas & Dave had written a song "Hot Shot Tottenham" in anticipation of Spurs overcoming Watford in the FA Cup Semi-Final, and I was making the necessary advance plans with a new label, Rainbow. Sure enough, I spent the morning of Mon. 13th Apr. discussing with Michael Hurll, the producer of Top of the Pops, the likelihood of Glenn & Chris appearing on the show, and the afternoon with the whole squad in the Pye Studios, near Marble Arch, recording their latest Cup Final song. 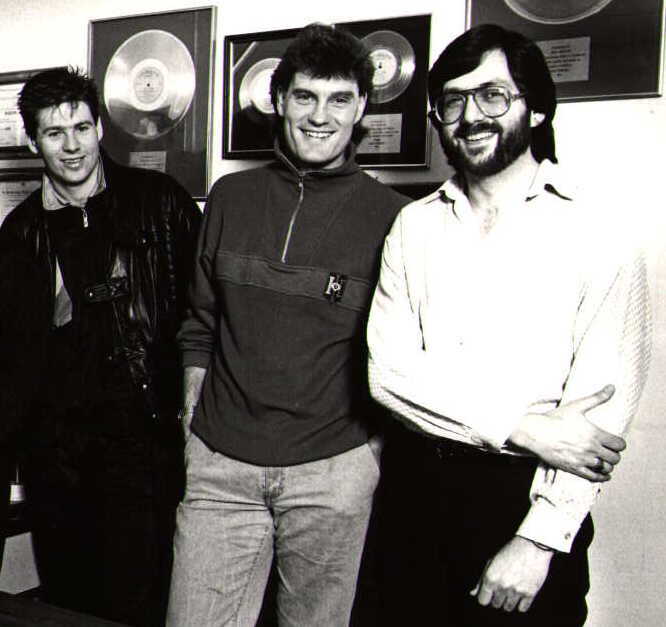 The next day, "Diamond Lights" entered the UK Top 40 at No.30. I had been speaking to BBC's Grandstand about doing something special around the record, and when they heard that it had charted and was looking good for the following week, they came up with a plan - and it involved ME. They decided to have a film crew follow the lads and me for a few days, making a 'special' for their Cup Final coverage. I didn't know, but when I arrived at the Top of the Pops office, early on the morning of Tues. 21st, for first news of the Charts and the producer's decision as to who he was booking, there was a full BBC crew set up for recording. They were in Michael Hurll's office when he received the phone call from Gallup, and then they came outside to where all the record promoters, like myself, were gathered for his decision. The cameras and lights were on me as he announced that "Diamond Lights" had risen to No. 17, and ask me if Glenn & Chris were "available". Very relieved, I simply replied "available". 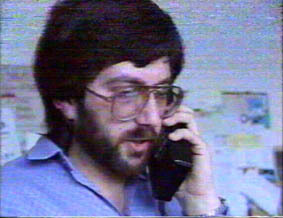 They then filmed me phoning the Waddle household on my primitive mobile (remember those that were the size of a brick?!). Well that was when the hard work began! I thought I had it all planned. 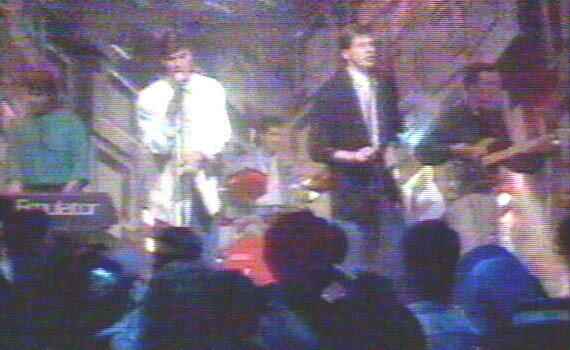 As TOTP was to be live on the Thu., and Spurs were away to Wimbledon the previous night, the lads would have Thu. as a day off, and they could do the show without any problems. But that was not how it worked out. Glenn (or was it Chris?) told me on the Weds. morning that neither of them were in the side for the Wimbledon match, and that meant no day off on the Thursday. They HAD to be at TV Centre by 11.30am latest, and manager David Pleat wouldn't budge. I tried to arrange a later call-time at the BBC, but they couldn't change it, so I was asked if they needed to withdraw from the programme. "Absolutely NOT", I replied, but I could not think of a way out of it. I began to make enquiries about the possibility of hiring a helicopter to fly the lads from the Cheshunt training ground to land at White City, but it was not possible, no matter how much Record Shack were prepared to pay. Jeff Weston told me that I had no option but to get David Pleat to change his mind. So I went to Plough Lane for the game, and neither Glenn nor Chris were there. It was a 2-2 draw and Brian Gayle was controversially sent off following an incident with Nico Classen. Don't ask me how, but I managed to get past Security and confront David Pleat outside the Visitors' Dressing Room. I explained our predicament, but he told me that both Hoddle & Waddle had said they had minor knocks and so they had to report for treatment, which would take place AFTER the morning training session (of reserves and those not enjoying a day off). I pleaded and asked if they could not have their treatment, first thing, and be let off early. He asked if all this was REALLY important to them (!!???!!) As I was explaining just how much it meant to all of us involved, I noticed that physio John Sheridan was in earshot, and I beckoned him over. He listened to my problem and told David that he'd prepare to see to the lads early and let them get away, but as they weren't there they wouldn't know the change of plan. Now you must remember that back in '87 not many people had mobile phones (they cost over £2000 in those days), but I pulled mine out of my pocket and called both Glenn & Chris and gave the phone to John each time. SORTED. 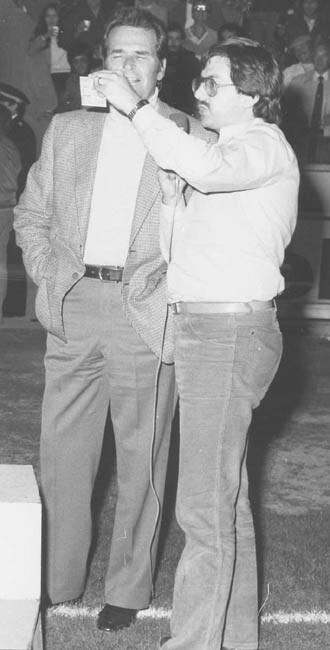 I then called a very relieved Jeff Weston, and finally Hoddy Wood who was directing the Grandstand 'special'. So, the next morning Hoddy's crew were at Cheshunt, when I hooked up with them and a chauffeured car. By 10.30am, we were on our way to the BBC. I sat between Glenn & Chris in the back, with a cameraman in the front seat, filming us. Much of that journey was used in the eventual TV programme. The first rehearsal went OK- sort of. But there was a slight complication. Chris Waddle had a long-standing signing-session for his sponsors, Nike, at a sports shop in Stevenage, in his diary for that afternoon. We thought it had been cancelled, but somebody forgot, and we knew that a lot of kids would be turning up, expecting him. No option. So during the gap between the end of that first rehearsal and the call for the Dress Rehearsal at about 4.15pm, I accompanied Chris and our cameraman in our chauffeured car to Stevenage, and back to the BBC. In the meantime Glenn made use of the 'down-time' by doing a couple of radio interviews, by telephone, and enjoying a nice lunch. Chris & I returned, just in time (though we were starving) and the Dress Rehearsal went much better and the lads felt much more confident. As show time drew near, my old friend Andy Peebles arrived. He was to interview the lads, and some of the other artists on the show, for the Grandstand feature. The BBC also brought Chris' wife Lorna, and Glenn's then-wife Anne and they were also interviewed by Andy. The show was already going out live on BBC-1. Kim Wilde was there; so were Five Star. As we sat in the Dressing Room, we could listen to the transmission over a speaker. As soon as we heard Tom Jones "The Boy From Nowhere", we knew that was the cue to go to the studio and for the lads to take their positions on the stage. 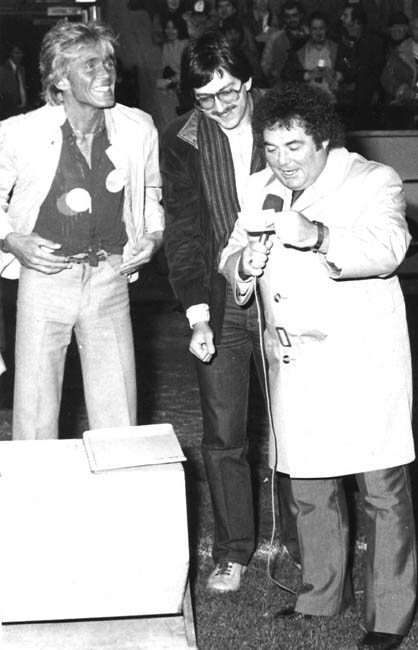 Then presenter Gary Davies made some inane quip and introduced Glenn & Chris and "Diamond Lights". The song's writer, Bob Puzey, formed the backing band, and accompanied them on keyboards. Suddenly it was all over. They may have looked a little stilted and like fish-out-of-water, but no matter. Two Spurs and England internationals had made a mainstream (non-novelty) pop record, and it was a HIT. Soon after the strains of the No.1 song, Starship's "Nothing's Gonna Stop Us" had faded out, we were out of there and on our way for a super meal at Langan's Brasserie, in Mayfair. Quite an adventure. Somehow, I wish that a photographer would have been around a bit more often during my time working in football. I had nightmares trying to get Paul Gascoigne to act responsibly, when we were promoting his "Fog On The Tyne" record. 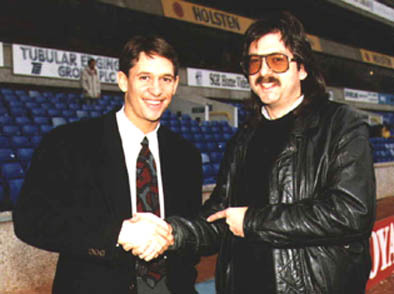 I have to say that Gary Lineker came to my assistance on more than one occasion. He's a gem.